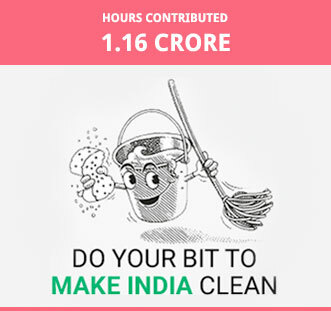 As NDTV-Dettol Banega Swachh India enters into its fifth year with focus on SWACHH (Sanitation, Wash, Air pollution, Cleanliness, Health and Hygiene), Amitabh Bachhan kicks off the 12-hour cleanathon at Juhu Beach, Mumbai. 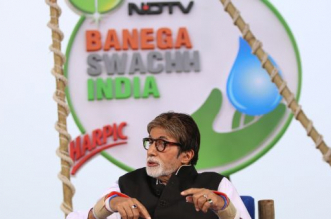 Amitabh Bachhan kick starts the season 5 of the 12-hour cleanathon at Juhu Beach, Mumbai. 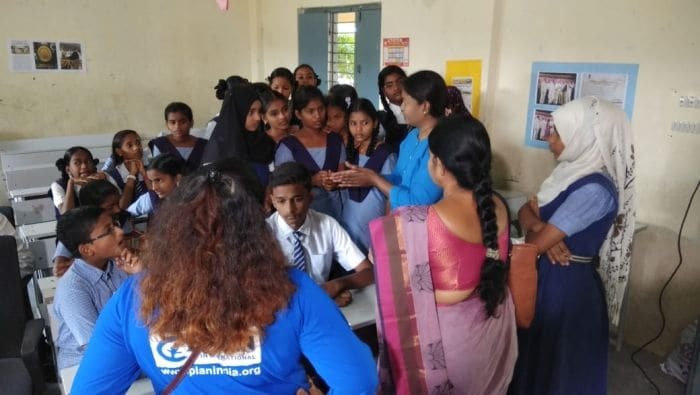 Telangana: Zilla Parishad School at Narsingi, Ranga Reddy district, celebrates Rashtriya Swachhata Diwas by discussing the pivotal role sanitation plays in an individual's life with students. 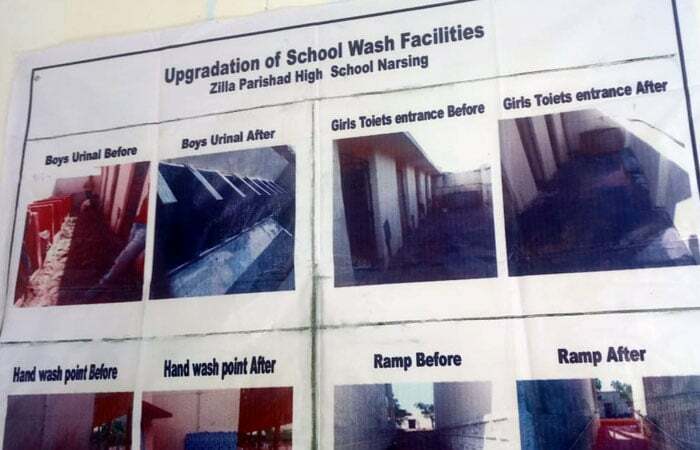 Telangana: Zila Parishad School in Narsingi displays improvement in terms of sanitation. 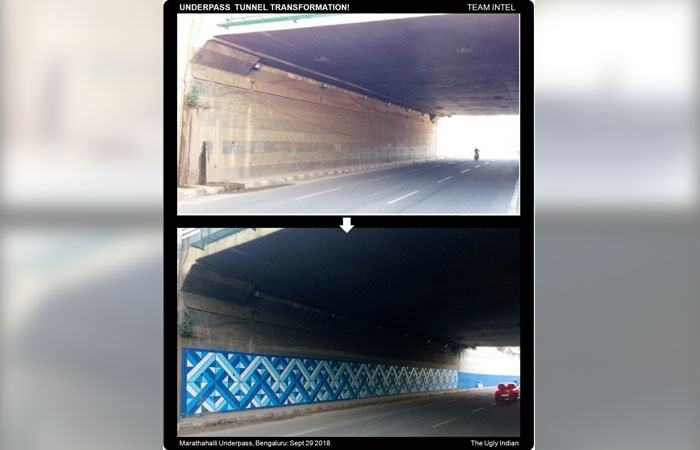 Bengaluru: Marathahali Underpass Tunnel gets a new look, thanks to an initiative by the Ugly Indians, an anonymous bunch of swachh warriors. 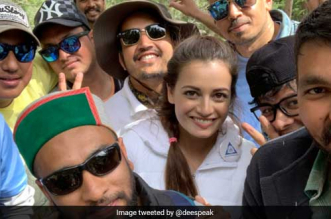 Peepal Baba, a swachh warrior, who has planted over 20 million trees across India so far, organises a plantation drive in Noida with 200-300 people. Zilla Parishad School at Narsingi, Ranga Reddy district, Telangana awarded the 'Swachh Vidhyalaya Puruskar 2017-2018' for their performance in the development of Water, Sanitation and Hygiene in Schools. 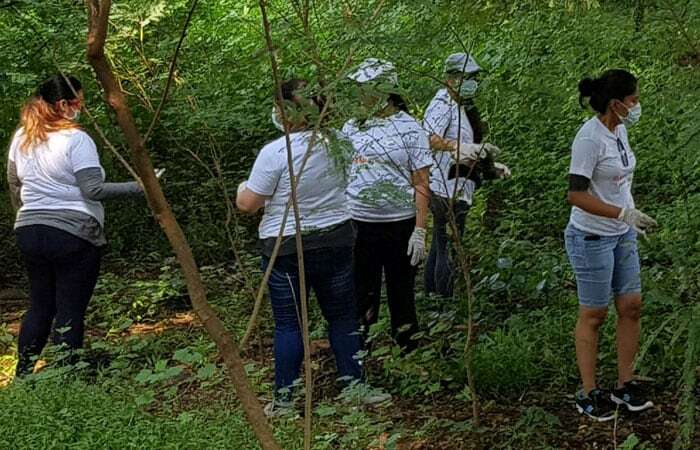 Volunteers at the Mangrove Sampling Plantation Drive, Navi Mumbai. 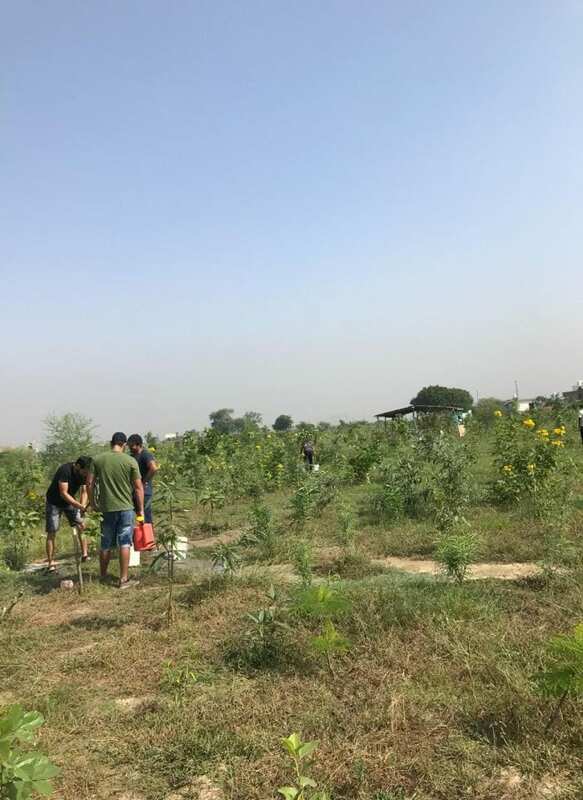 Volunteers at the plantation drive at Mangrove. After the 2005 Mumbai floods, citizens realised the potential of Mangrove and initiated the Mangrove Program in Navi Mumbai. 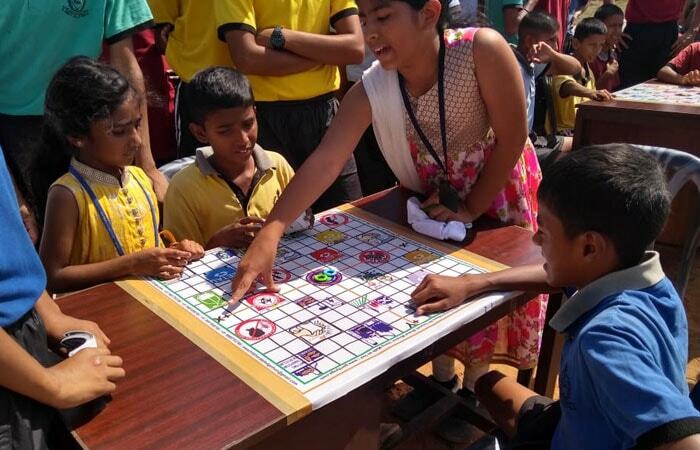 Volunteers teach students about breaking the germ cycle with the help of an interactive game at Rashtriya Military School, Dholpur, Rajasthan. 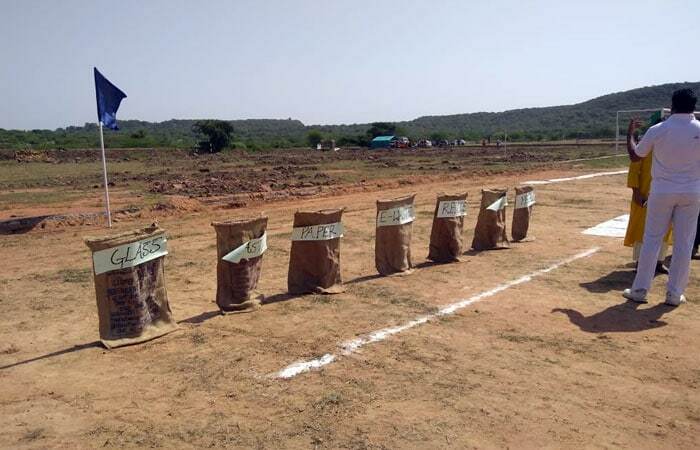 Volunteers creating awareness among the students of Rashtriya Military School, Dholpur, Rajasthan with the help interactive games. 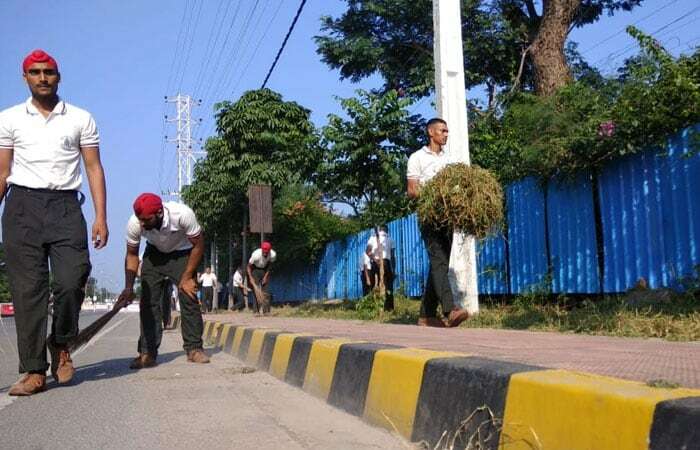 Trainee soldiers celebrating Rashtriya Swachhta Diwas by cleaning the streets of Hyderabad. 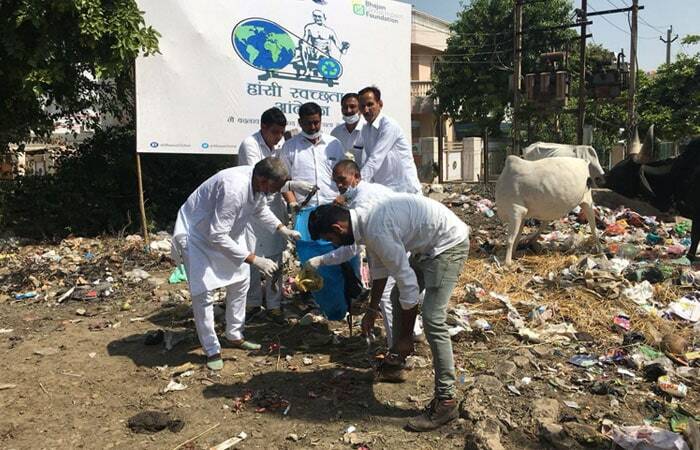 Clean up Drive at Hansi, Haryana organised by MLA Renuka Bishnoi and other local politicians. 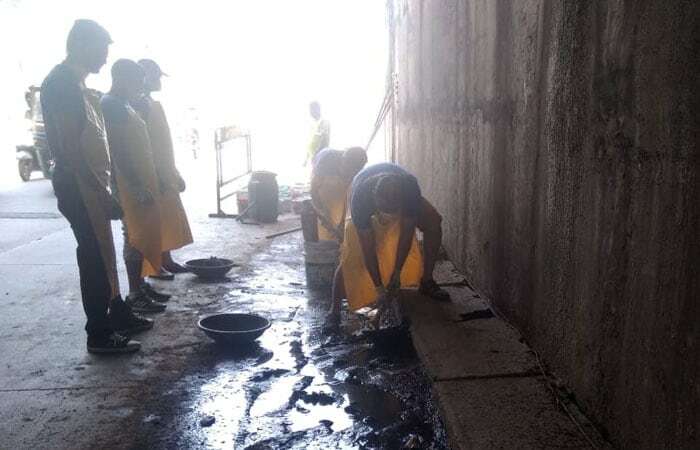 Volunteers cleaning up the underpass in Bengaluru. 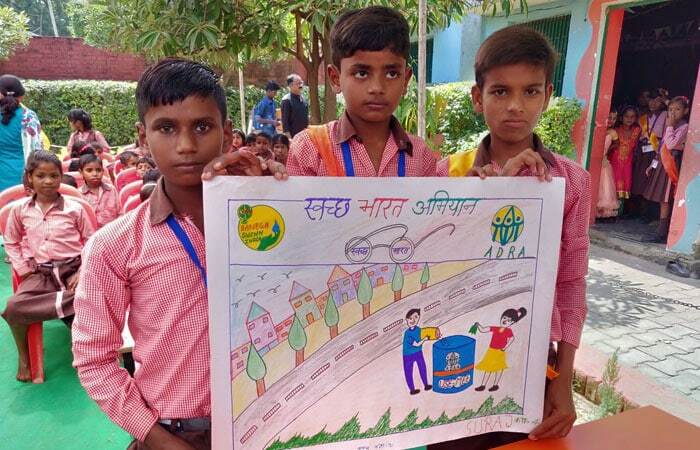 Varanasi: Kids participate in a painting competition, celebrate Gandhi Jayanti which is observed as Rashtriya Swachhta Diwas. 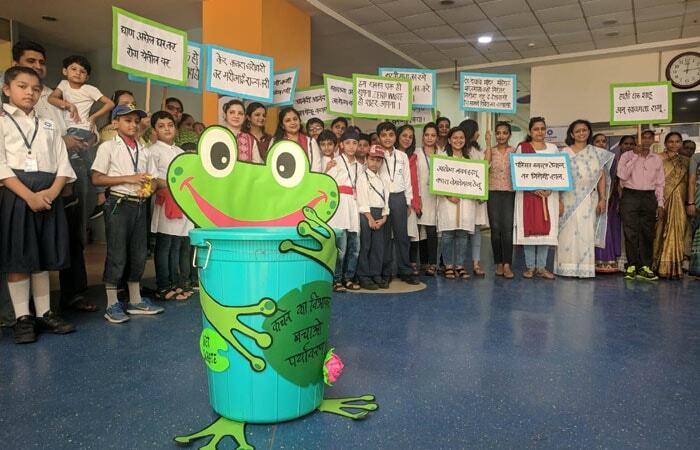 Students of grade 4 and grade 5 of Euro School in Navi Mumbai participating in street plays, creating awareness about waste segregation and composting as the solution of waste. 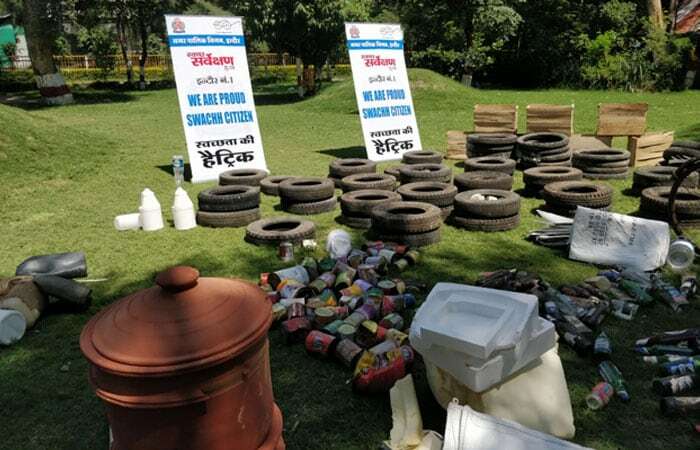 The 'Disposable Free Gang' in Indore pledged to ban usage of disposable items in the city. 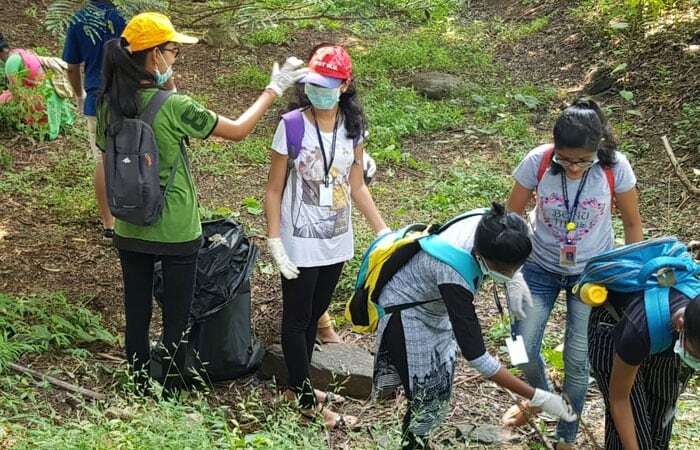 Students in Indore plan to create 'best out of waste' in the state to remain the cleanest city of India. 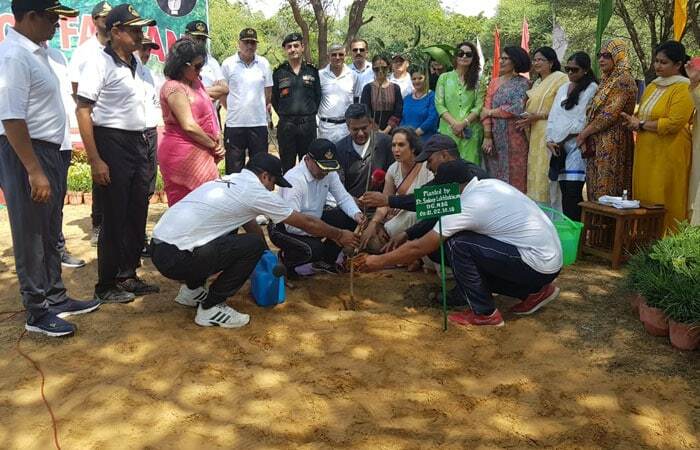 National Security Guard Director General, families, jawans and their kids plant trees at NSG headquarters at Manesar. 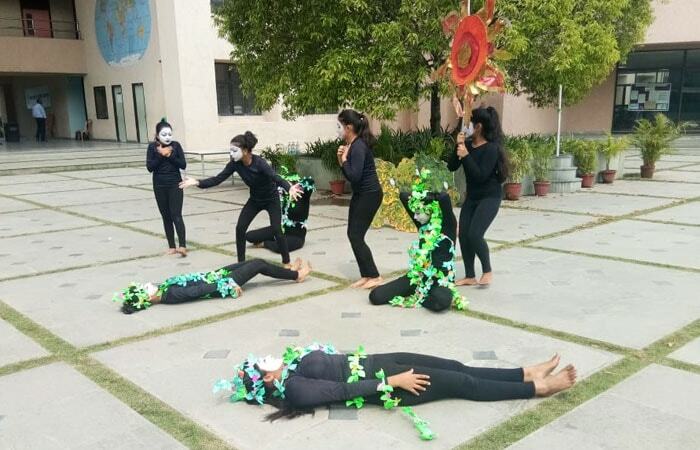 Students of Delhi Public School, Kolkata, performed mime highlighting the importance of planting trees. 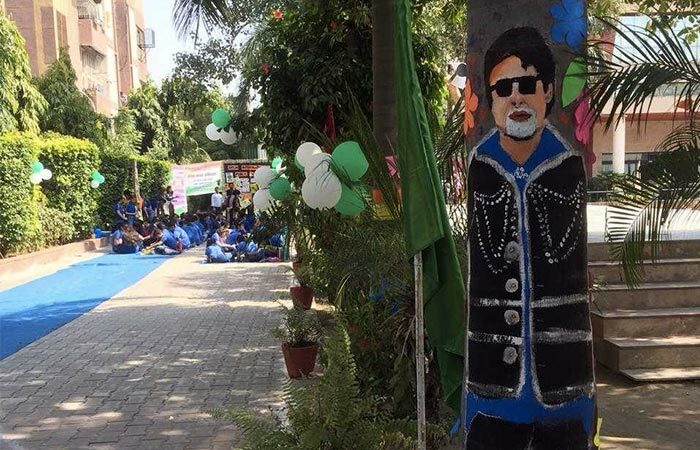 Students of Delhi International Public School painted the 'Banega Swachh India' Campaign Ambassador, Amitabh Bachhan, on a tree at their school. 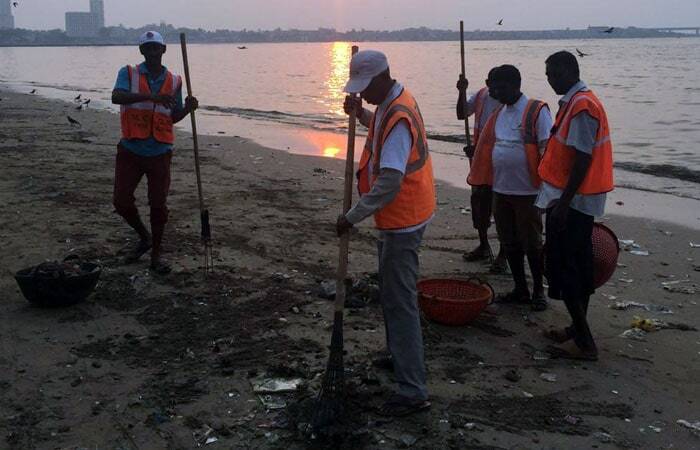 BMC Safai Karmacharis and Beach Warriors cleaning up Dadar Beach during the Cleanathon on as part Banega Swachh India campaign. 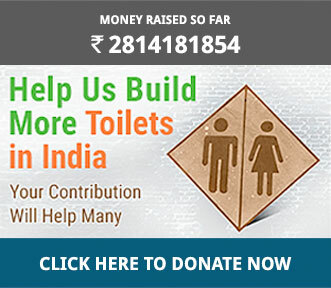 Clean up drive organised by volunteers at the Banks of River Kali, District Meerut.